They are a small, family-owned company, which you know I love to support. 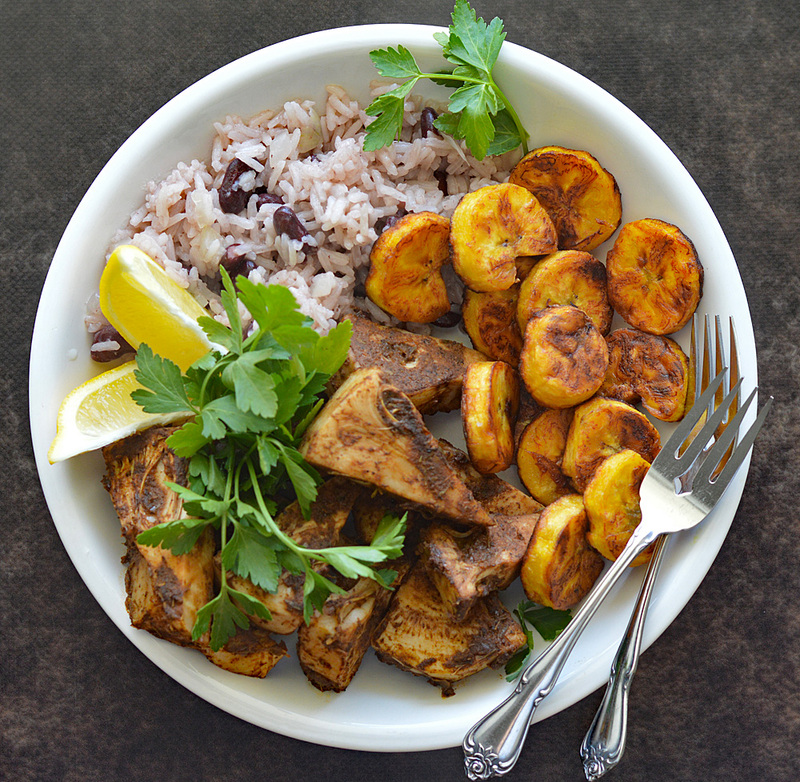 Run by Rory and his wife to introduce the flavors of their combined Jamaican & Indian cultures to their son (and thankfully, to us). I really hope you guys go check out their products! They were kind enough to send me a few samples so I could bring you this post. 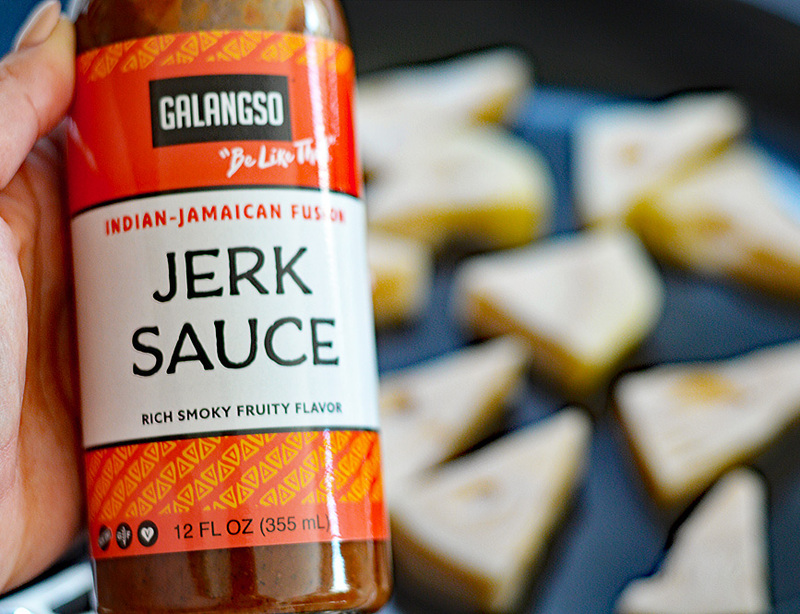 As mentioned above, I’ll be using this GALANGSO JERK SAUCE & MARINADE by Nature’s Kitchen. I left the jackfruit in large pieces but this would equally impressive as a sort of “pulled” jackfruit scenario. I actually may try that next time. 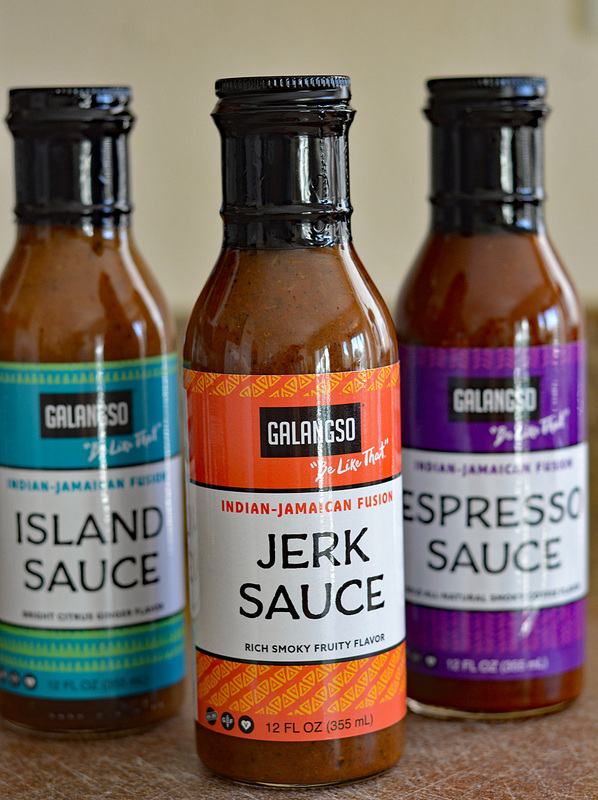 Rich, smoky, fruity flavor – the label describes this sauce perfectly! Just wanted to mention that I am testing out a new brand of jackfruit, this one is in water (rather than a salty brine) which I am super excited about. I have a feeling this is going to be my new “go-to” jackfruit. 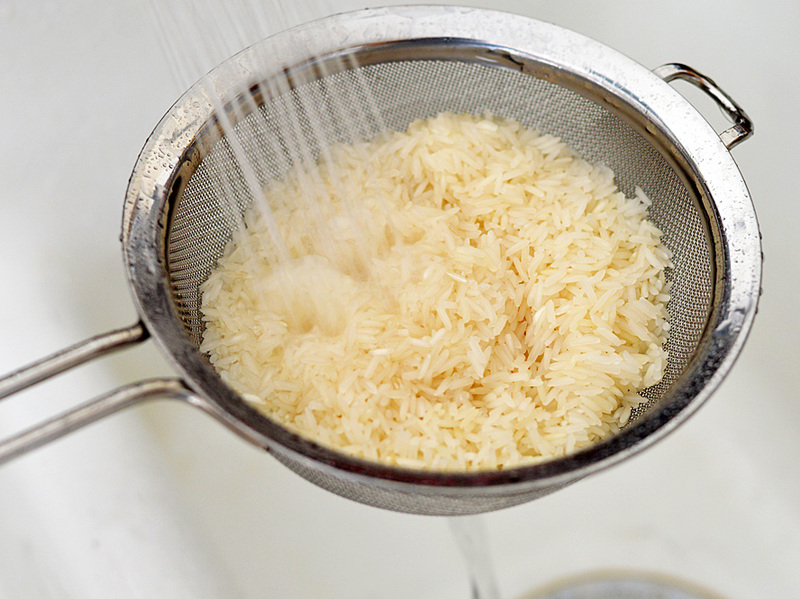 While the jackfruit is cooking, I like to get the rice rinsed. Combine the rice with chopped onion, minced garlic, water, the beans (WITH it’s liquid <—- super important step), coconut milk, salt and pepper. Bring to a boil and then reduce the heat to low, cover and allow to cook for 15 minutes. Remove from the heat and allow to sit until all of the liquid is absorbed. I also like my rice a bit drier, so I also allow it to see for a bit with the lid off. This creates a fluffier rice. If you have a rice cooker or I guess even an Instant Pot, this would work great there as well. I could not stop eating this rice. Why have I never tried rice with coconut milk before??? 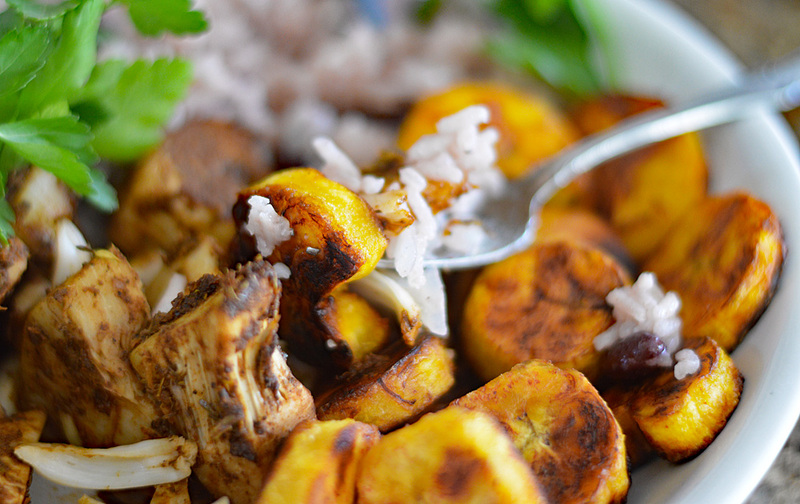 If I can share one tip with you about the plantains is to buy them well in advance of when you need to use them. Unlike bananas, they took a LOT longer to ripen and rather than yellow being ripe, we are looking for more of a blackened color. 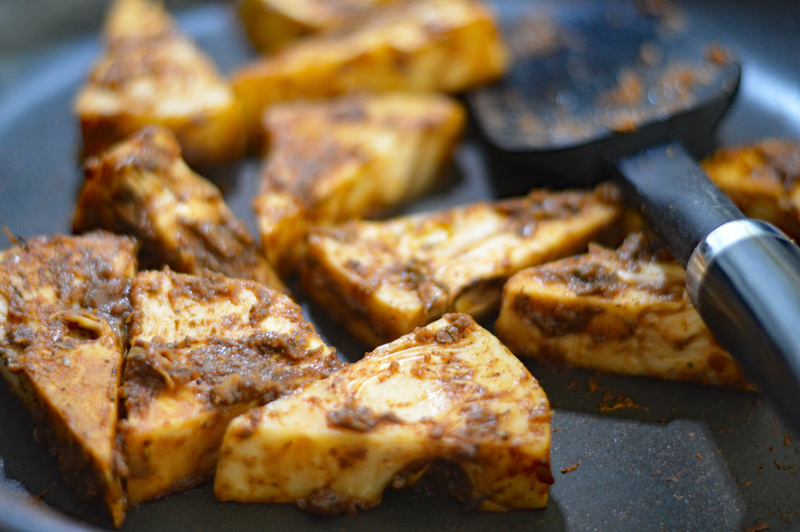 Slice and place into a hot pan with oil. Simply fry until golden on either side and remove to paper towels to drain. I loved these with a pinch of salt. In addition to the Jerk Sauce, Nature’s Kitchen also sent me their Island Sauce and Espresso Sauce which I am really excited to try next! I really think you are going to love this savory dish. Let me know if you give it a try! *This is not a sponsored post, however, I’d like to extend a special thanks to Nature’s Kitchen for sending me product in order to create this original recipe for you. Please visit them at Nature’s Kitchen to shop and be sure to show them some love on social media: FACEBOOK, TWITTER, PINTEREST and INSTAGRAM. 1/2 can Kidney Beans INCLUDING LIQUID!! 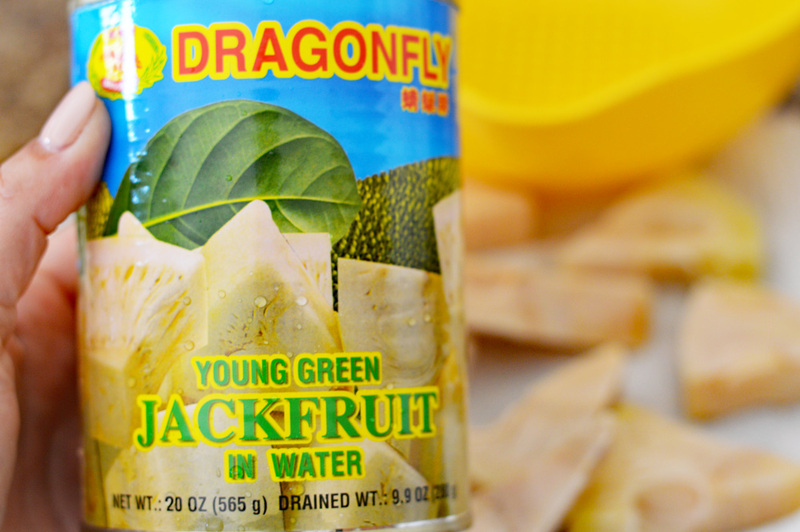 Drain, rinse and pat jackfruit dry. You can leave it whole as I did, or using your fingers, tear it into "pulled" jackfruit. Add to a non-stick skillet over medium high heat and add sauce. Cook until you get caramelized edges. Rinse and dry the rice. 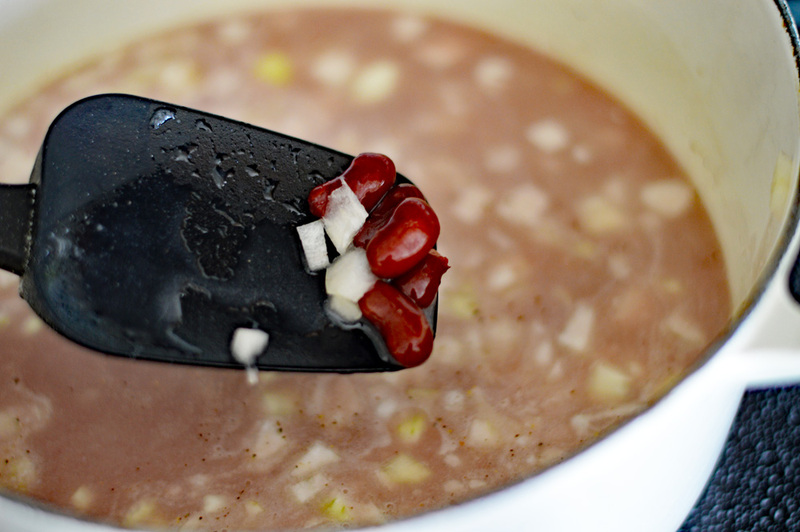 Drain the beans into a 2 cup measuring cup so that you can reserve the liquid. Add the 1/2 can of coconut milk to the same measuring cup and finally, top off that measuring cup with enough water to equal 2 full cups of liquid. Add to a large stock pot with the rice, beans, garlic, onion, salt and pepper. Heat to boiling and cook for 2 minutes, reduce heat and cook for about 15 minutes covered. Remove from heat and allow to sit for 5 more minutes. Remove cover and allow to sit until all water is absorbed. Fluff with a fork. 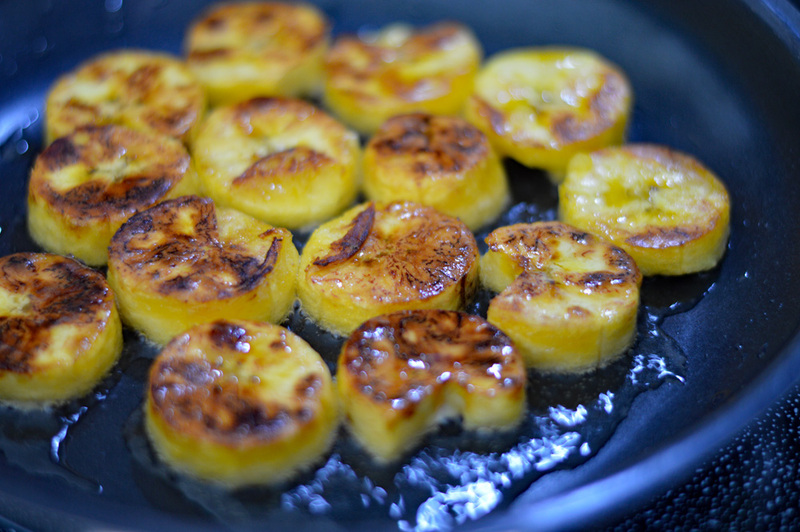 In a non-stick skillet over medium high heat, add the oil and sliced plantains. Cook one side until golden, flip and repeat. Remove to paper towels to drain any excess oil.